Spider-Man is an awsome Marvel Superhero, one of his strngths is how he can climb up anything. 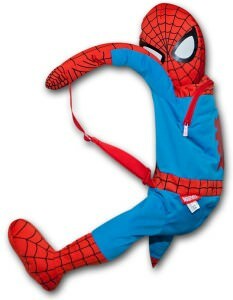 Now you can make it look like you have the awsome Marvel Superhero Spider-man climbing up your back every time you throw on this Spider-Man backpack buddy. This backpack is definetly one of the coolest ones you will find, it is made from nice soft plush material with one large zippered opening and has 2 adjustable shoulder straps and 1 waist strap to tighten up your Spider-man buddy nice and close. Put on your Spider-Man Marvel Plush Backpack Buddy.